U.S. Secretary of State Mike Pompeo meets with Israeli Prime Minister Benjamin Netanyahu in Jerusalem on March 20, 2019. Credit: Kobi Gideon/GPO. 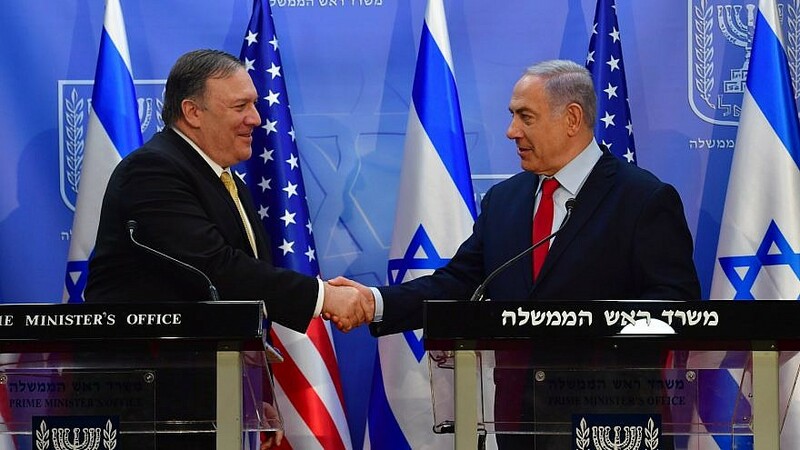 (March 20, 2019 / JNS) U.S. Secretary of State Mike Pompeo met with Israeli Prime Minister Benjamin Netanyahu on Wednesday in Jerusalem, just weeks before Israelis go to the polls on April 9, as the two emphasized the close relationship between the United States and Israel. “No less historic was [U.S] President [Donald] Trump’s decision to walk away from the disastrous nuclear deal with Iran,” he added. Pompeo added that the United States was “proud to deploy” the THAAD missile-defense system earlier this month. Additionally, the secretary of state said that the U.S. is combating anti-Semitism, citing the “dark wave” in America and Europe. The visit comes as Netanyahu is scheduled to travel to Washington next week, where he will address the annual AIPAC Policy Conference. The prime minister will also meet with Trump, announced the White House on Wednesday.